Summary: Hue Lights bars designed for Hue Sync and taking your gaming and on screen action to a new level. We review the Philips Hue Play. So the Philips Hue Play Light bar has landed, lights that are designed specifically with Hue sync in mind, the Philips app that syncs on-screen action and music with your lights. We take a look at the Philips Hue Play, what you get, how it works and if it is worth buying. 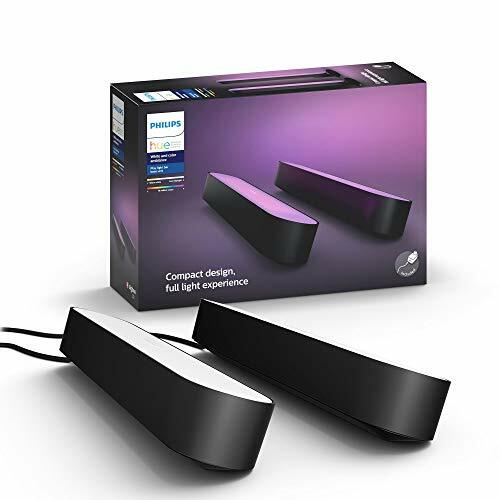 There are a few options for the Hue Play bar, firstly you can buy it in either black or white. 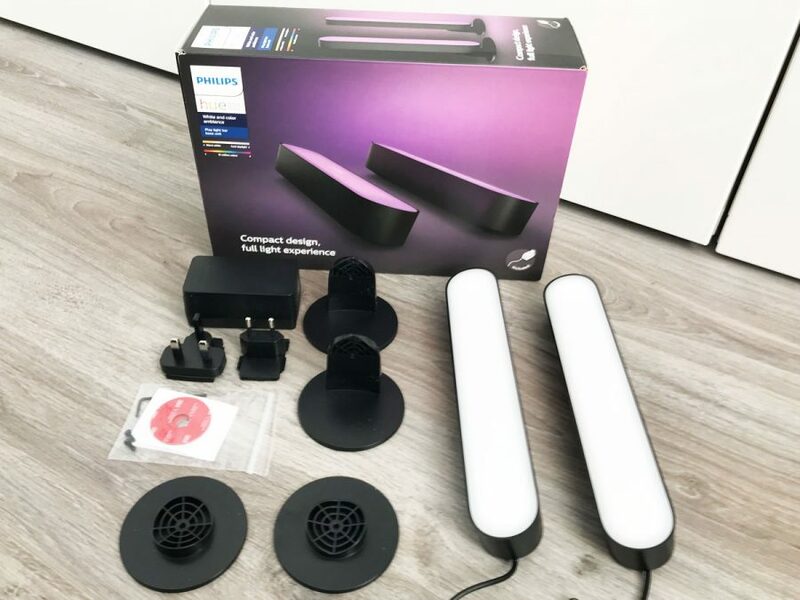 Each color can be bought as a pair as shown in this review, a single light with power pack, or an extension light which doesn’t have a power pack and would be an addition to the twin pack as below, giving you 3 lights in total. 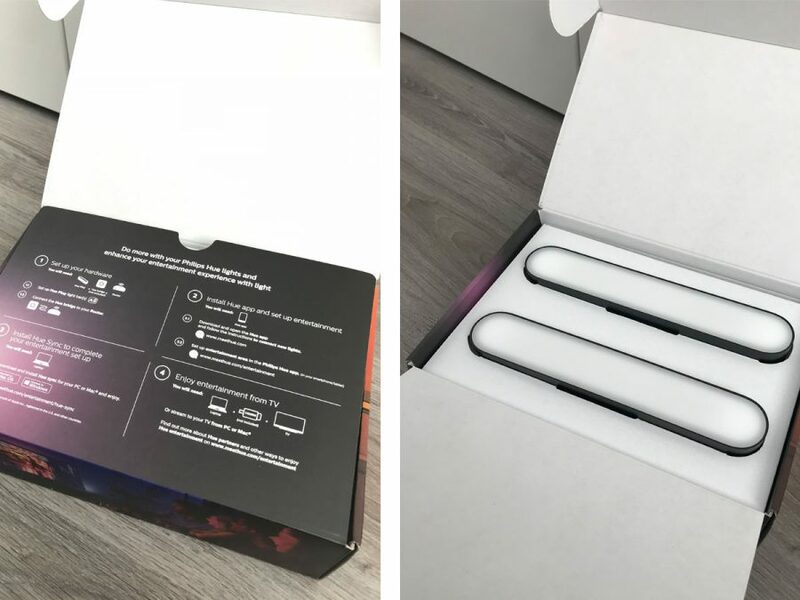 The packaging matches the rest of the Hue lights with a dark box, and purple lighting from the Hue play bars. 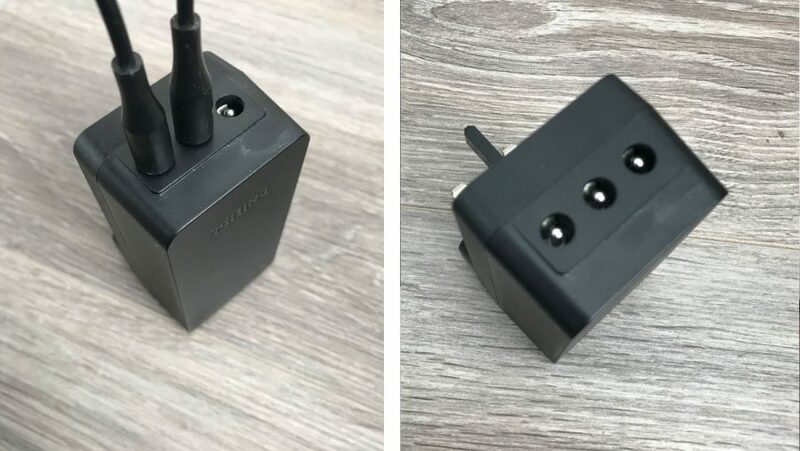 Inside you get 2 Hue Play Bars with attached wires coming from them, a mains power plug transformer with plug adapters depending where you live, I got a UK and EU plug adapter. You then get two pairs of different stands, one is upright, the other flat. The upright allows you to stand the light bars upright on your desk or behind your tv, the flat mounts are designed to be attached to the back of your TV or display. They come with small screws that attach the mount to the light using a small included Allen key. There are also two sticky pads for attaching the mounts to the back of your display. The stands and mounts do not need to be used, the bars can be placed on a flat surface without the need for a mount. 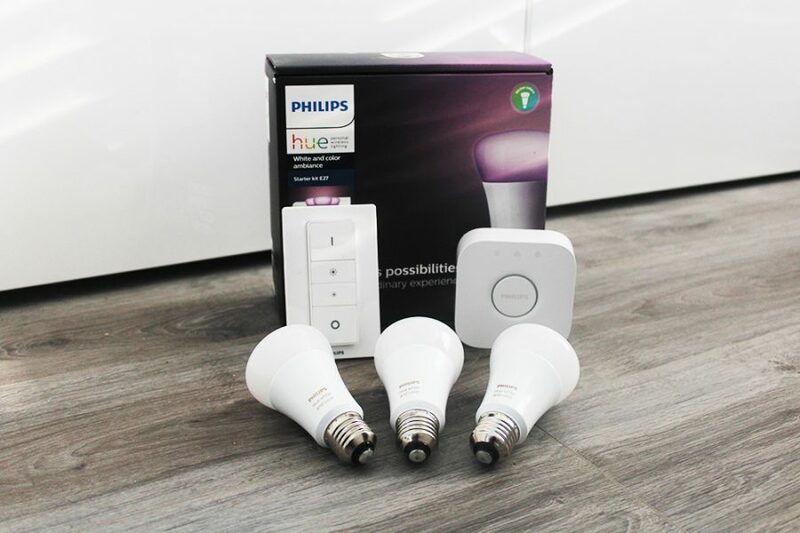 To use and set up your Hue Play, you do need a Hue bridge, if you are new to Philips Hue, the bridge connects your bulbs to your network and allows you to operate them. The Hue Play set does not come with a bridge and must be bought separately if you don’t already have one. Although it comes with instructions it is simple to set up, each light bar has a wire coming from it with a small adaptor on the end which connects into the power transformer that gets plugged into the mains. The plug transformer has sockets for 3 lights to be plugged in, this set comes with two, you can buy an individual light that doesn’t come with the plug which would just plug in to make up the 3 lights. With 3 lights you would have one either side of your display, and then one in the middle pointing upwards. Once all plugged in you just load the Hue app and add them as you would with any other Hue bulb. Once added, add them to a room and then you can add them to an entertainment area. To use Hue sync you need an entertainment area set up, here you can position each of the Hue play bar lights as they are positioned behind your TV. Read our guide here to setting up Hue Entertainment areas via the app. 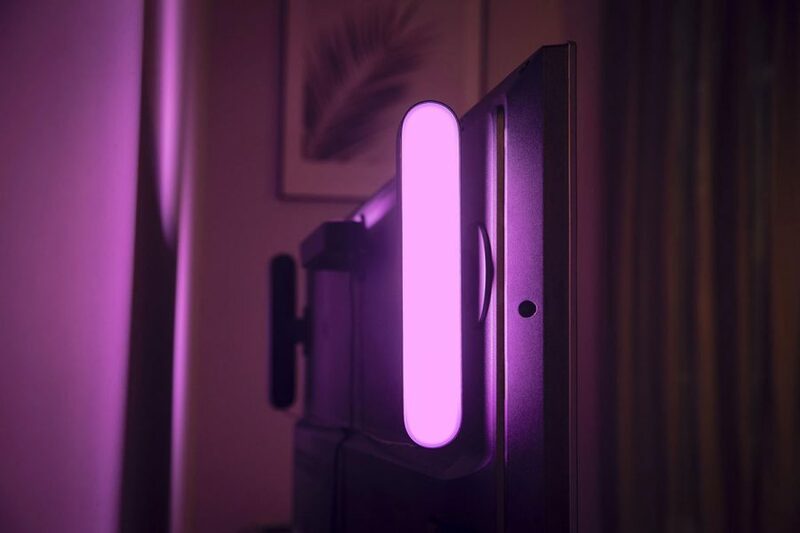 You can operate the Hue light bars just like a Hue bulb, they are completely adjustable just like other Hue lights, so you can set one to blue and the other to green. So if you don’t plan to use them with Hue sync or behind your TV you can use them just like other Hue lights and position them where you would like a nice light effect. The light bars themselves are well designed and built, the base of them have a rubber angled base so they are titled towards a wall to shine up against, ideal for use on a desk or table top if they are not mounted. One thing that stands out is the light itself, it is well diffused so there is no sign of any of the LEDs inside, unlike the Hue Light strip where the LEDs are obvious and isn’t really diffused at all. 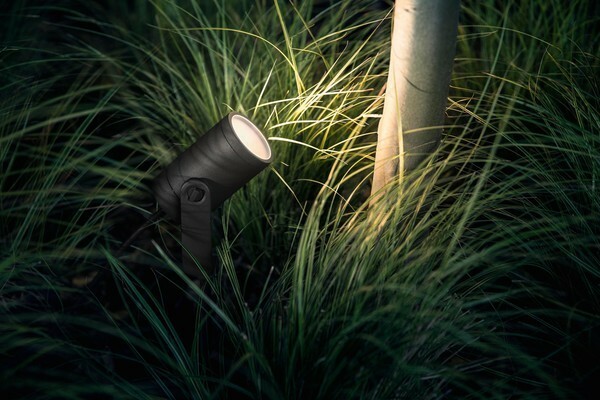 Each light is 530lm, 25.3cm in length, 4.4cm wide, and 3.6cm in height. These lights have a IP20 rating and should not be used outside. The mains transformer allows you to plug in 3 light bars to power them, this is great as you only then need one socket to power up to 3 light bars, this is good. However the cable length on each light isn’t massive, the total length of the cable that is built into the light bar is 2 metres long. So from the mains plug you have a 2m length to play with to get the light bar to where you want it. So depending on your set up, where your power socket is, how large the TV is, there isn’t a lot of cable to get from the power socket, up to the TV and into position. 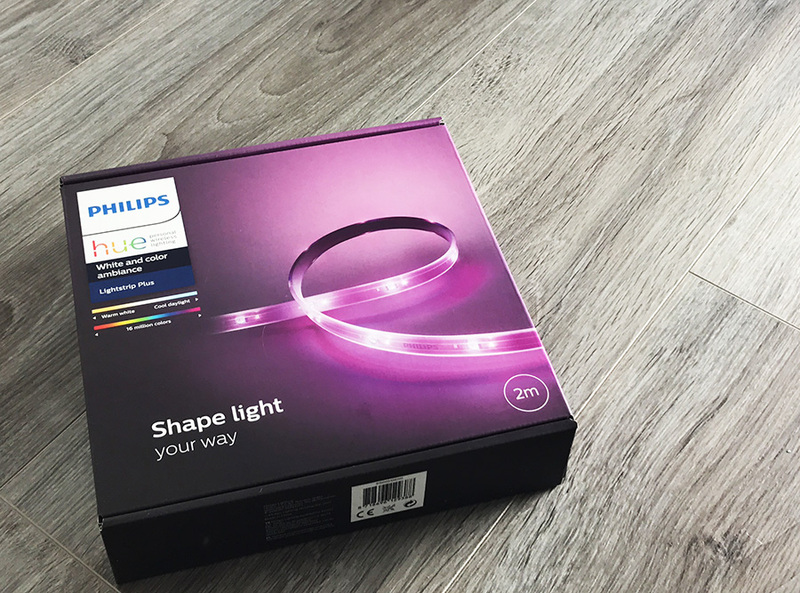 This may not be a issue for many people, however if it is a stretch you can either buy a Philips Hue Play Extension Cable which is 5m long, or the cheaper option is a mains extension cable. 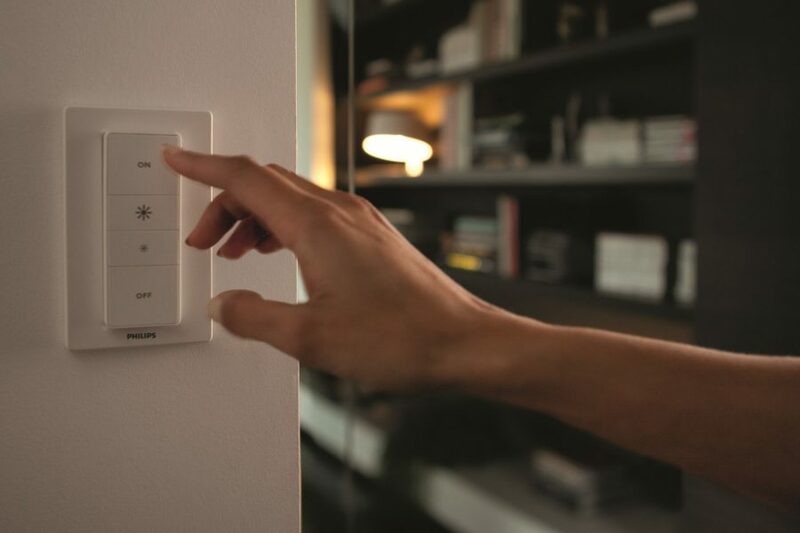 Hue Sync is the brains and software behind ensuring the lights change the right colour and quickly, the lights themselves are clear, bright and responsive. They give a good clear glow and as said before they are well diffused so there is no sign of any LED’s like on a light strip. Here are two videos of the Hue play bars in action on an iMac using Hue sync, there is also a Hue Lightstrip in the mix too. Nature video showing the deep blue and strong colors. Music video and film with bright color and contrast. I love Hue lights and these are great, they are designed really well, nicely built and the light effects are really good. Everything is in place, we have the physical lights, we have the software and function in Hue Sync to change the lights, we just need a link between TV displays, gaming consoles and online streaming services such as Netflix and Amazon Prime to allow for the use of this. The technology is here, we just need the services and providers to get on board. Are they worth it? Yes and no, if you are into gaming then yes, they certainly add a new dimension. If you want to use them on the big screen for watching films on Netflix or with your TV, then not at the moment, until there is official support making it easier to work with these services it doesn’t seem worth it. Overall they are another great addition to the Hue eco system, however to maximise there use and potential the key needs to be found to link them to your TV and streaming services. Buy the Philips Hue Play on Amazon. Thanks for the review, the videos are great. Might be better without the light strip though as that doesn’t change color correctly sometimes. Thanks, may post a new video up without the lightstrip in use. Have ordered mine, have ordered a 3rd to go across the top too. These don’t have the richer colors logo on the box. So the blue, green, cyan colors not as good as the A19 bulbs? True this icon is not on the box however I haven’t had an issue with the colors. Ciao a tutti. Volevo sapere se funzionano senza il collegamento ad internet. Volevo usarlo come ambilight per in mio tv non connesso. E POSSIBBILE? Dove si acquistano ? No an internet connection is not needed, however a Hue bridge is. The advertising is very misleading, imho. From what I can tell so far is that these are no more useful than the other Hue lights I have. I was under the impression that I could actually sync these with my tct, but just like regular Hue products, this is only possible through Hue sync. You could do this with any of the lights. Basically, you can only sync through a computer and not with regular TV programming. I could be mistaken here, but I’m finding nothing about these lights that is any different from the rest of the product line. The strips do the exact same thing already. In terms of the lights they are better than other Hue lights, such as light strips, they are diffused and give a good crisp color, however these are just lights like other hue products. The means to using them via your TV still isn’t here other than using Hue Sync via a computer like you say. I have been thinking of replacing my under cabinet lighting with these. Thoughts? They are big, so maybe seen, depends how you plan to use and fit them. The light is good and better than a light strip, just installing them in a way so they are hidden. I recently bought myself a Hue Play light bar and installed it on the back of my TV. I must say that I already love it. It gives me a perfect backlight when I am watching TV and I can adjust the brightness and color after what I am watching. I have not had a change to play much with the sync feature, but I think I will in the time to come.